Iran’s Supreme Leader Ayatollah Ali Khamenei today endorsed the election of Hassan Rouhani as the new president of the country. 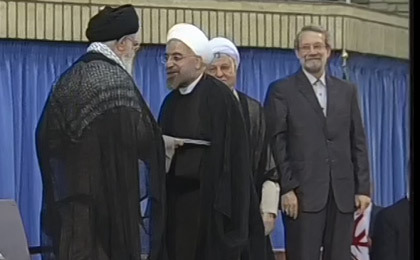 The action, which took place during a ceremony in Tehran that began at 16:00 local time (07:30 EST), officially made Rouhani the seventh president of the Islamic Republic. President Rouhani’s public inauguration will be held on Sunday. His overwhelming victory at the polls on June 14 brought back the control of the executive branch of the government under the moderates, after eight rocky years of presidency of Mahmoud Ahmadinejad. In Iran, the supreme leader is the governing (as opposed to ceremonial) head of state, the most powerful position in the country. The president is the head of the executive branch of the government, equivalent to an elected prime minister. Iranian media is reporting that eleven presidents, two prime ministers and seven parliament speakers will participate in Rouhani’s inauguration ceremony on Sunday. They include presidents of Afghanistan, Pakistan, Kazakhstan, Tajikistan, Turkmenistan, Lebanon, Armenia, North Korea, Sudan, Sri Lanka and Togo as well as the prime ministers of Syria and Swaziland. The parliament speakers of Russia, Venezuela, Algeria, Azerbaijan, the United Arab Emirates, Uzbekistan, the Democratic Republic of the Congo, and the foreign ministers of South Africa, India, Brazil, Turkey, Mauritania, Sri Lanka, Burundi and Palestine will also attend the ceremony. The vice-presidents of Nicaragua, Tanzania, Cuba and Ghana, and former European Union foreign policy chief, Javier Solana, are also among the attendees. Photos: Iran’s Supreme Leader Ayatollah Ali Khamenei and President Rouhani along with other senior leaders at the confirmation ceremony of the new president. Tehran, 3 August 2013. Well it wouldn't have been considered "rocky" if during those eight years, your family received one of those millions of newly constructed public housing units through a 99 year mortgage. It also wouldn't be considered "rocky" if your village was one of the many that received a newly constructed public road, school, nearby hospital and electricity. It also wouldn't necessarily have been considered "rocky" if your town was one of the numerous where the president visited, and you got to see a real life president of your country for the very first time in your life. But, yes, if you were one of those folks glued to reading media reports, particularly foreign, of Iran's relations with the West, yes it would be considered a "rocky" eight years. President Ahmadi-Nejad was a world leader uniting the Non-Aligned Countries against the oligarchs and Zionists falsely using the US flag to commit War Crimes and Terrorism wherever their diktat was not bowed to. He hosted many Conferences on State Terror, on Democracy and on WW11, all this we want to hear, even in European countries. He supported the oppressed Palestinians ignored by Europe and now under Israeli diktat Hezbollah is falsely labelled 'terrorist' when the Zionists are the worst terrorists on the Planet. I hope President Rouhani will keep these flags flying and that the Iranian people can turn the unlawful sanctions to advantage. Lets pray for a new start for Iran. Ha Ha Ha Ha!! Four more years of Farib va Rea! Millions of constructed public Housing?? Are you deluded? I used to take some of your reports seriously, but you have indeed sunk very low now. Ahmadinejad did improve the lot of the poor people and over 2 million public housing units were built alleviating poverty. It is also interesting to note that China only sent a low level delegation for the inauguration, once again proving the point that Iran should not depend on the money hungry Chinese as they have no long term stable friendships or dependable alliances. China is only interested in dollars and hence their penchant for dollar shops all around the world. It is good to see that Iran's other powerful neighbors like India did send high level delegations to show their friendship and respect for Iran's democratic processes. The majority of Iranian people rejected Ahmadinejad’s policies at the poll. In small and big town, in rural and urban areas, in central as well as bordering cities, in Qum as well as Baluchistan, all over Iran people voted to reject extremism and accept moderation, in both domestic as well as foreign policies of their government. To the majority of people, those eight years were not just rocky, by simply disastrous. The argument that only a small segment of society, the relatively well-off youths with access to foreign media, was not happy with their government proved fictitious. The majority of all classes, nationalities, ethnicities voted for moderation and rejected Jalili’s hardline policies, which were closest to Ahmadinejad than any other candidates. This is the lesson of the election and it was healthy and good for the future of the country if all concerned recognize and accept the realities of the country, and help move the country forward. The majority of people of Iran had a chance to choose between Jalili, the candidate closest politically to Ahmadinejad, and Rouhani, the candidate farthest away from his views and policies, and chose Rouhani and rejected Jalili. They voted to accept moderation and reject extremism. That is the reality of today’s Iran. majority of Iranian people voted for moderation, because Ahmadinejad brought so many sanctions on Iran! Yes, I know it's us congress and Us president signing those sanctions into Law! but Ahmadinejad made it so easy for them to do so! We have to focus on removing the sanctions so Iran can be prosperous once again! According to the above list, the Chinese did not send anybody ! This should not mean that they are signaling any change in their policy toward Iran. They know very well that a large share of Iran' external trade sector goes to them ! You mean haters like you. I believe I read in the Farsi media that the Chinese had sent a junior Minister of Culture or something. In any case, you are right China is exploiting the folly of the American idiots who under Zionism are hurting their own deadbeat economy as well. Iran could have created many high paying jobs in the US manufacturing and aircraft industries if these moronic sanctions had not stopped it from buying more planes, spares, industrial equipment and chemicals. Iran is more or less an advanced industrial/petro-chemical economy with a growing manufacturing base and the US could have benefitted by selling it billions of dollars worth of goods and creating high-value jobs, rather than the $7 an hour hamburger flipper part-time "jobs" without any benefits that await the US high-school dropouts and college graduates. Even according to the US Buiness Chamber the struggling American economy has lost over $300 billion worth of business and over 150,000 high paying jobs due to these sanctions and subservience to Zionism. It is time the American people wake-up and make amends with Iran by taking advantage of this window of change in Iranian politics. This will be a lost opportunity because if the Zionists keep pushing Iran, it will only go back into a more extreme nationalistic mode and then any chance of reproachment or detente is gone for good. US is playing into the hands of the Chinese by destroying its own deadbeat economy by warmongering and endless "homeland insecurity" paranoia, while business and economic power moves to Asia and China. I am no fan of China and think they are unprincipled money grabbing uncouth vultures who are gouging Iran with inferior third-rate goods and looting our oil. In any case, the Chinese like trained monkeys can only assemble western or Japanese technology based goods and have ZERO INNOVATION. I have managed Chinese engineers who simply lack the imagination to think outside the box or come up with their own designs. They are masters of copy and paste. Even Indians are far better in original research and innovation. It is no surprise that China can't produce a jet engine or even a commercial airliner. China buys Russian jets and then steals the technology and comes up with even more inferior crap. Iran should be very wary of the Chinese as we have nothing in common, either culturally, socially or economically. At least with Indians we share a history and many cultural aspects, including their language Urdu which is heavily influenced by Farsi, which was the language of the Persian speaking Moghuls for 400 years. Even the Taj Mahal and Red Fort in Delhi are built by Persians, namely the architect Shirazi. It would be in US interest to cut the crap and improve relations with Iran, the only natural ally and stable nation in the region and it is in long-term US strategic interests as sooner or later China and US are poised for conflict. At least with Americans we share a lot of common things including the same Caucasian race and cultural affiliations. 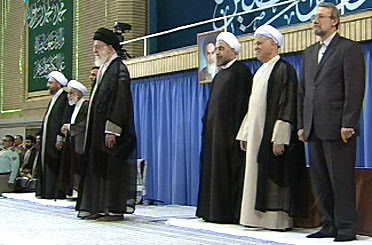 Janati and the wisdom of the Guardian Council, as well as a cooperation of other politicians (Ahmadinejad, Rafsanjani had not chalenged their disqualification) and Qalibaf - Velayati's thoughtful decision to run simultaneously, assured (automatically) Rouhan'i entrance for at least a runoff stage..., or a narrow (lightly over 50%) victory in the first stage. There was no a call from the establishment for any particular candidate, except a call for a defeat of the enemy through widespread participation and clean election without disturbances, dreamed by the enemies.